Gene Sharp is relatively unknown to the American public. Around the world he is held in high esteem by activists and is regarded with fear and animosity by many authoritarian leaders. 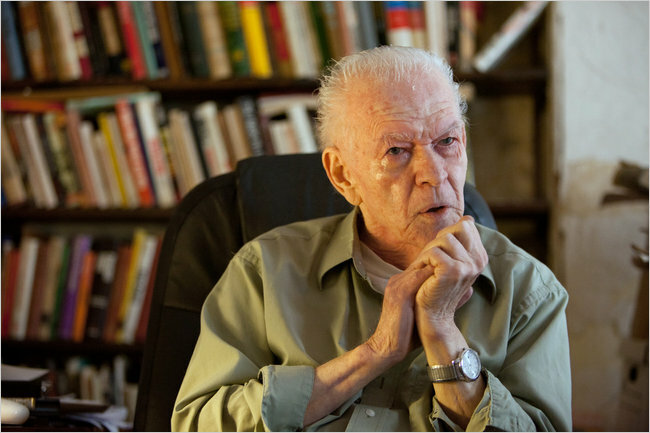 This humble, shy 83-year-old intellectual, through his practical writings on non-violent revolution, has had a broad influence on international events for two decades. Though he is quick to dismiss his role, his ideas are credited with helping to advance a global democratic awakening. In 2005, two Moscow bookstores selling Russian translations of a book written by Mr. Sharp were mysteriously burnt down. In June 2007, Venezuelan President Hugo Chavez accused Mr. Sharp of stirring unrest in Venezuela. In 2010 in Vietnam opposition activists were arrested for distributing a book written by Mr. Sharp. Most recently his 102 page pdf document, “From Dictatorship to Democracy,” which is available in 28 languages, has inspired dissidents in Tunisia and Egypt and was used by movements that toppled the governments of Belarus, Georgia, Kyrgyzstan, Serbia and the Ukraine. The book has been declared illegal in Iran. Sharp’s “Civilian-Based Defense,” a PDF document of 174 pages, was used by the Estonian, Latvian and Lithuanian governments during their separation from the Soviet Union in 1991. Gene Sharp’s fundamental philosophy is that all dictatorial power depends on, and devolves from, the subjects’ obedience to the orders of the ruler. Sharp cites the French judge Étienne de La Boétie, a founder of modern French political philosophy, that if the subjects of a particular state recognize that they are the source of the state’s power they can refuse their obedience and leaders will be left without power. Several years ago, Mr. Sharp drastically curtailed operations due to a funding cut. He dismissed most of his staff, closed his office in the business district of Boston and retreated to a modest brick townhouse near Logan Airport. He has never married and is childless. Mr. Sharp spends most of his days in the company of a young assistant, Jamila Raqib, and a massive black dog named Caesar. For relaxation he tends to the orchids in a greenhouse on the top floor. Reading your post was a pleasure.